Carol Long draws influence from plant and animal life and is fascinated by the small complexities of the micro aspects of nature. Her work continues to evolve as she experiments with new ways of expressing the tiny beautiful intrinsic qualities of nature that we often take for granted. Born in 1965, Carol Long was raised on a farm in Stafford County Kansas. The farm having been homesteaded in the 1880’s had by the time of her childhood matured with enormous trees and a thick shelter belt. In these wooded areas Carol explored and found a connection with nature developing a total appreciation of plant and animal life. Her mother also had an interest in art and often took Carol to art museums. Carol often felt a need to express herself by bringing her imagination to life. She remembers as a child using one of her father’s cattle syringes filled with mud to draw structures in the driveway. In High School, Carol excelled in art. 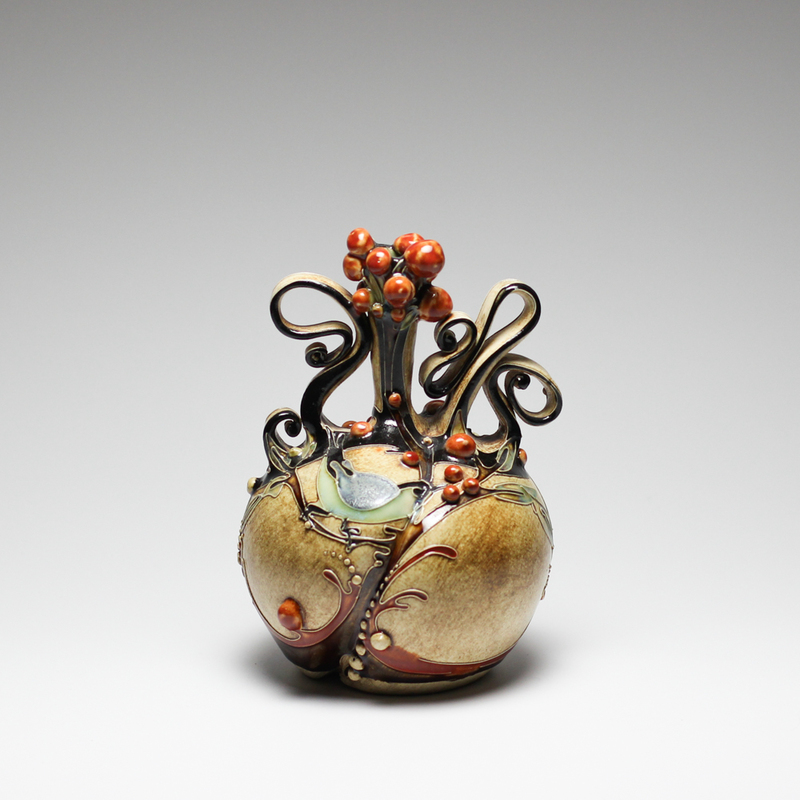 Her teacher, Sheldon Ganstrom, who is now a prominent Raku artist helped spark Carol’s interest in ceramics. She then moved on to Barton County Community College where she realized that she was always drawn to the ceramics lab. She has studied under Glenda Taylor, Linda Ganstrom, and Steve Dudek. Carol has now taken on two apprentices Mark Freeman and Bambi Freeman. Carol is thrilled with the new energy in her studio and is looking forward to new venues and future expansion.